Rod Storage Systems. Rod and Reel Hanger Set. Anodized Finish: Gold. For: Penn International 70VS. Constructed of Marine Grade Anodized Aluminum Bright Gold. Reel is attached to Hanger by spring loaded pins riding in bracket. Pins snap into harness lugs on top of reel. Reel cannot swing since it is held in upright position. Tip of Rod is placed into Locking End of set and the Nylon Ring is rotated to lock it in. Can be mounted Horizontally, Vertically or Overhead.Rod Storage Systems. Rod and Reel Hanger Set. 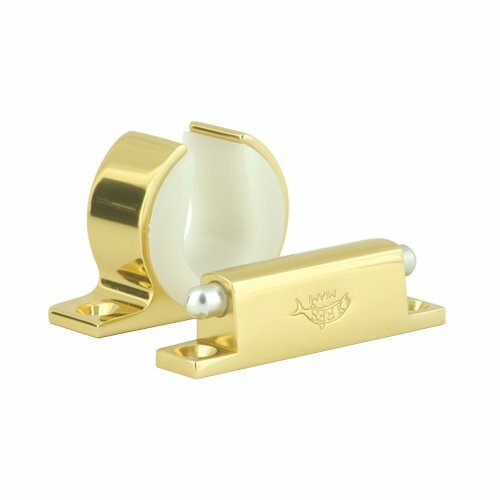 Constructed of Marine Grade Anodized Aluminum Bright Gold.